A question that I have been asked before by JWs is when Jesus was praying in the Garden of Gethsemane to God was he praying to himself? My answer to this question is that the question assumes modalism. We as Christians believe that Jesus, God the Son, is a different person than God the Father. In the incarnation there is no problem with Jesus praying to the person of God the Father and addressing him as God. God the Son humbled himself and took upon the form of a servant and became obedient onto death (Phil 2:5-11) as an example for us (1 Cor 11:1). In the incarnation he humbled himself in obedience to God the Father and worships the Father as God. We also see in Hebrews 1:8 where God the Father addresses God the Son as God. The three personal members of the Trinity have no issue in addressing one another with the title God as the doctrine of the Trinity teaches that all three persons are fully God. In John 10:30 Jesus says that He and the Father are one. This has a two fold meaning Jesus in the context is stating that He and the Father are one in purpose and intention when it comes to the Salvation and security of His sheep. It also bears the meaning that they are one in the being of God. We can see that this later meaning is definitely how the Jews who heard him understood what He said because they picked up stones to stone Him for making Himself to be God (Jn 10:33). Jehovah’s Witnesses may make the argument that the Trinity is illogical because Christians are saying that 1+1+1=1. The problem with this argument is that it assumes Unitarianism and demonstrates that the one making the argument has no idea what Christians actually believe about the Trinity. The argument has a category error and is confusing the categories of person and being, which Christians differentiate, and is making them synonymous. The answer to this is that 1 person + 1 person + 1 person = 3 persons and 1 being of God = 1 God. This next section will contain the questions that I like to ask JWs to challenge them from their own perverted version of the Bible (NWT). These questions all work with the Bible that all JWs carry. When encountering JWs it is helpful to use arguments and texts of Scripture they have not encountered before. All the traditional texts that defend the deity of Christ like John 1, Phillippians 2, Colossians 1, etc. will not be helpful to use in an encounter with a JW as they can articulate their arguments against these texts almost from a state of comatosis as they have addressed these so often. These traditional passages have been mangled sufficiently by the NWT translators that their impact is gone. For example the NWT has change John 1:1 from “the Word was God” to “the Word was a god”. Don’t try to argue with them from these text unless you are a Greek scholar because you will get no where. All the examples I give below from my experience are not arguments that they have encountered before and these arguments can all be used with their own Bibles. 1. Ask them to give you some of the attributes that make up the being of Jehovah God? If they need help you can give them the attribute list below and they will agree with them. 2. Once they have agreed with the list ask them if Jesus Christ carries these attributes. JWs believe Jesus Christ to be a created being who is Michael the Archangel so they will have to say, “no”. 3. Next ask them if the attributes that make up the being of Jehovah are exactly represented in Jesus Christ? Can Jesus contain all the fullness of these divine qualities in himself? In other words ask them if Jesus Christ can be infinite, eternal, and omniscient as Jehovah is? They will have to say “no”. 4. Ask them to read Heb 1:3 and Colossians 2:9 from their Bible. 1. Ask them to read Isaiah 10:21. 2. Ask them from the context who is Might God? Answer, Jehovah. Ask them if Jesus is Mighty God or is this a title for Jehovah alone? They will have to say, “no, Mighty God is for Jehovah alone”. 3. Ask them to read Isaiah 9:6. 4. Ask them who the “Mighty God” is in this text? 1. Ask them to read Isaiah 44:6. 2. Ask them who here has the title of “the first and the last“? The answer is “Jehovah”. 4. Ask them who was living, became dead and then became living forever and ever? The answer is “Jesus”. Ask how that can be because Jesus says here “I am the First and the Last” a title only for Jehovah? 2. Ask them if Jesus Christ is the Word (logos) here in John 1:1 and John 1:14? 3. Ask them if verse 14 says that Jehovah God is giving his glory to this lesser created god called the Logos (Jesus)? 5. If they say “yes” to the previous question, ask them to read Isaiah 42:8 and then Isaiah 43:10. 6. Ask them, in light of these verses, will Jehovah give his glory to another and has there ever been a god formed after Jehovah? This argument is quite effective. It is based upon the use of the Greek word ‘proskuneo’. The NWT has translated the word ‘proskuneo’ in every place it is in reference to Jehovah as ‘worship’ and in every place it is in reference to Jesus as ‘obeisance’. This is an attempt to diminish as much as possible the impact of the New Testament record of the worship of Christ. 1. Ask them to read Matthew 4:9-10. Point out that the words ‘worship’ in this verse are translated from the Greek word ‘proskuneo’. 2. Ask them if we are to give ‘proskuneo’ worship or obeisance to any other than Jehovah according to Jesus? 3. Ask them to read Matthew 14:33 and 15:25. 4. Point out that the word obeisance here is translated from the Greek word ‘proskuneo’ which Jesus said in Matthew 4:9-10 that we are to give to Jehovah only. 5. Ask them to read Revelation 19:10. 6. What happened when the Apostle John fell down and tried to worship and Angel? 8. Is the lamb that was slain (Jesus Christ) worshiped in this passage? Psalms 102:25 Long ago you laid the foundations of the earth, And the heavens are the work of your hands. 26 They will perish, but you will remain; Just like a garment they will all wear out. Just like clothing you will replace them, and they will pass away. 2. Who is spoken about in Psalms 102:25-27? Answer, Jehovah. 3. Ask them to read Hebrews 1:7-12. 8 But about the Son, he says: “God is your throne forever and ever, and the scepter of your Kingdom is the scepter of uprightness. 10 And: “At the beginning, O Lord, you laid the foundations of the earth, and the heavens are the works of your hands. 4. Does God attribute Psalms 102:25-27 to His Son? 5. Does the cross reference in your Bible for Hebrews 1:10-12 point to Psalms 102:25-27? It does. 6. According to this text doesn’t it demonstrate that God the Father and the Son are one and the same being? 1. Ask them if Jehovah has performed the greatest act of love? 3. Who has performed the greatest act of love? Jesus has and since Jesus is Jehovah than Jehovah has performed the greatest act of love. Hi, thnx for this article. I wanted to share an easy ‘seed’ anyone can share with a JW when they come by. Ask them if they have a copy of the book ‘What Does The Bible Really Teach?’ There’s a 98% chance they will have it with them as all new JWs must study this book. Ask them to turn to p38 It is a picture of Jesus being baptized. Ask them to read the caption. It says ‘At his baptism Jesus becomes the Messiah or Christ.’ Ask if they believe that. (They do!) Ask them to read you Luke 2:11 from their bible. It says ‘For today there was born to you in David’s city a savior, WHO IS CHRIST the Lord.’ Ask why the Angel says the baby Jesus IS CHRIST if Jesus doesn’t become the Christ until baptism? Ask is that what the bible really teaches? You could end the conversation here by saying you’re not interested in taking their literature if you wanted. 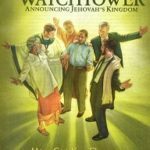 I wrote a free pdf with more tips called “10 Reasons I’m NOT a Jehovah’s Witness” with more info. Check it out and feel free to distribute or use it in your ministry. May God Bless. Great information. That is a great argument. I have looked over your pdf and it looks great. I will delve into it more. I found your youtube channel and subbed. God bless.